Home / Artists / Damien Hirst / Meatballs from "Last Supper"
Damien Hirst, Meatballs from "Last Supper"
Title: Meatballs from "Last Supper"
"Meatballs" is from"The Last Supper" a suite of 13 screenprints that was Damien Hirst's debut graphic oeuvre. The prints mimic the graphic design of medicinal industry packaging, using colors reminiscent of Hirst’s ongoing Spot Painting series, inspired by commercial drug firm product catalogues. 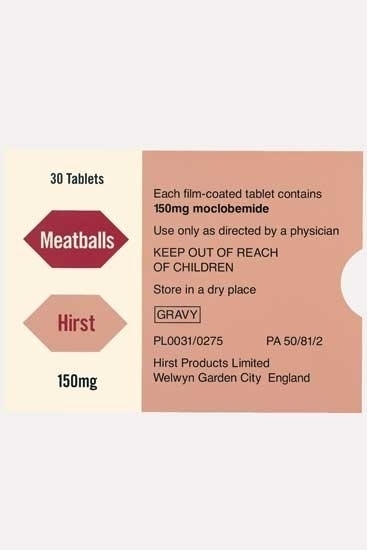 In addition to the product number and dosage information, each typographically individual print has the drug name substituted for pedestrian British foods such as Beans, Chips and Cornish Pasty and in this case Meatballs. Familiar company trademarks are replaced with the artist’s own name or a stylized "corporate" D+H logo. Hirst is posing a question about Western Civilization's unquestioning belief in large corporations and to a degree, the blind faith inherent in contemporary society for pharmaceutical drugs to ease our pain and heal the body. Parallels to the faith and commitment evident in religious belief are simply evoked through the appropriation of the conceptual structure of the Last Supper. 13 images representing the 13 participants at the meal, the title itself suggesting nutrition for the body and the spirit, coupled with decay and ultimately death – the ongoing theme of Hirst’s work. Hirst also presents himself as the inheritor of Warhol's mantel, as the portfolio is an homage to the Campbell Soup series. A colored Serigraph on 410 gsm Somerset Tub-sized Satin.